The biggest computer manufacturer in the world—IBM, was in a difficult situation in 1970s. 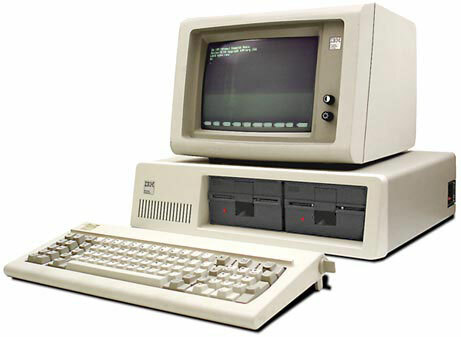 Despite of the IBM strategy and multimillion efforts to get into the small computer market, it was dominated by the Commodore PET, Atari 8-bit family, Apple II and Tandy Corporation's TRS-80s, as well as various CP/M machines. IBM dominated the market of mini, middle-range and mainframes computers, but didn't achieve even a small success in the very perspective microcomputers market. IBM's first desktop microcomputer was the IBM 5100, introduced in 1975. It was a complete system, with a built-in monitor, keyboard, and data storage, but it was very expensive—up to $20000, so it didn't achieve a market success. It was specifically designed for professional and scientific problem-solvers, not business users or hobbyists. Gradually the IBM management began thinking of producing microcomputers as a profitable business. When the PC was introduced in 1981, it was originally designated as the IBM 5150, putting it in the "5100" series, though its architecture wasn't directly descended from the IBM 5100. The IBM PC was created in about a year by a team of 12 IBM engineers and designers under the direction of Don Estridge of the IBM Entry Systems Division in Boca Raton, Florida. After hesitation between the Intel 8086 and the Motorola MC68000 (16 bit CPUs), they decided to use the Intel 8088 (8/16 bit) processor, as the two other ones were considered too powerful:-) Then they asked Digital Research (the creators of CP/M) to create an operating system for their new computer, but as DR was not very interested, they then asked a small company (known for its BASIC Programming Language, first used in Altair 8800) to write the operating system: Microsoft. Microsoft wasn't capable of doing it in the given timeframe, so its owner Bill Gates bought the rights to a small, hacked OS written by a small company called Seattle Computer Products: QDOS (which reportedly stood for "Quick and Dirty Operating System", which itself bears a striking resemblance to CP/M) which became PC-DOS and then later MS-DOS. In fact, when IBM PC was launched, three operating systems could run on it: PC-DOS, CPM-86, but also the UCSD D-PASCAL system. The original IBM PC wasn't very powerful (and was certainly less powerful than lot of 8 bit computers at the time). The very first PC’s had only 16 KB RAM and no floppy disk units, they used cassettes to load and store programs (notice that the commands to handle the cassette drives were present in the operating system all the way up to MS-DOS 5). In fact, units could also be purchased from IBM with drives and more RAM. Only the lowest cost version had no drives included (this is exactly how Atari, Apple and the other manufacturers did it as well). The model 5150 (see the upper image) was introduced in August, 1981 (see the IBM Personal Computer brochure). The system unit was a box with size 50.8 (W) x 40.6 (D) x 14 (H) cm, with built-in 63.5W switching power supply unit. It featured Intel 8008 CPU, working at speed 4.77 MHz, and an optional math co-coprocessor 8087. The RAM was 64 KB (the very first ones had only 16 KB), 256 KB max. (then later 640 KB max.) The ROM was 64 KB, included built-in language IBM BASIC (Special Microsoft BASIC-80 version). The keyboard was a full stroke 'clicky' 83 keys with 10 function keys and numeric keypad. The display was monochrome, working in text mode: (40 or 80 char x 25 lines) or 2 CGA graphic modes: (320 x 200 and 640 x 200). The sound was a tone generator with built-in speaker. The I/O ports were five internal 8 bit ISA slots, monitor, parallel (Centronics), cassette. The built in media was one or two 160 KB 5.25'' disk-drives. Three OS are provided—MS-DOS, CP/M-86, USCD Pascal. IBM PC 5150 became actually a success due to name and fame of IBM, high quality construction (especially the keyboard and monitor), great expandability and IBM's decision to publish complete technical specs. The IBM PC Technical manual included circuit diagrams and the full source code for the BIOS. While the original IBM PC technology is largely obsolete by today's standards, many are still in service. As of June 2006, IBM PC and XT models were still in use at the majority of U.S. National Weather Service upper-air observing sites. The computers were used to process data as it is returned from the ascending radiosonde, attached to a weather balloon. Factors that have contributed to the 5150 PC's longevity are its flexible modular design, open technical standard making information needed to adapt, modify, and repair it readily available, use of few special nonstandard parts, and rugged high-standard IBM manufacturing, the last of which provided for exceptional long-term reliability and durability. Most newer PCs, by contrast, use special-purpose chips (ASICs) implementing trend-driven technology which becomes obsolete in a few years, after which the parts become unavailable.